when two of rap’s most acclaimed crossover stars join forces, expectations can quickly soar to unrealistic heights. and perhaps rightly so. 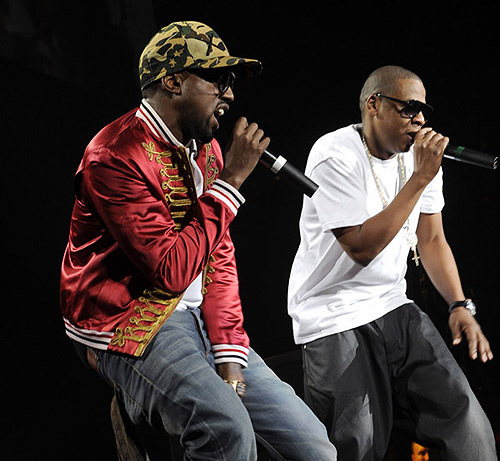 jay-z and kanye west have built careers on self-praise, egoism, and grandiosity. but they’ve also been the mc’s—and beatsmith in yeezy’s case—behind some of the past decade’s most exciting hip-hop and pop music. having set (and re-set) the bar higher and higher, and pushed the boundaries of the genre’s possibilities to new and unimagined places, anything less than gold for a pairing this auspicious would disappoint their fans to the delight of the naysayers and haters—just ask d. wade and l. james. having thoroughly vetted the twofer collaboration, however, i can enthusiastically report that watch the throne falls somewhere between instant classic and seminal masterwork. this record feels exciting and dangerous, like good hip-hop should. while the individual tracks vary a good bit in terms of style and tempo, the sustained formula is jay and kan trading off and, seemingly, trying to outdo one another verse for verse. the production is ambitious in its inventiveness and delivers on a fresh vision. you have your soulful “day tracks” and your more sweltering “night tracks”, both of which you’ll be bobbing your head and singing along to in no time given the countless hooks served up by no less impressive company than beyoncé and otis redding (via sample) to up-and-comer frank ocean. and since choosing just one track was proving too difficult, we’re serving up the whole thing for your repeated previewing pleasure. stream “otis” below, peep the rest of the album here, and keep it on repeat—what more can i say?